This all started with a Facebook post, but before I tell you anything more, I have a confession to make. I don’t have a Facebook page. I don’t have a Pinterest account. I don’t tweet or Instagram, either. My use of social media is pretty much non-existent. It’s a sad thing, and I know that I could attract more people to my blog if I used social media, but I just haven’t gotten around to it yet. I will probably set up at least a Facebook account before the end of the year, but as of today, I’m am without social media. As a result, I might have completely missed this recipe if a co-worker hadn’t passed around her phone at lunch to share the recipe that someone had shared on her page. 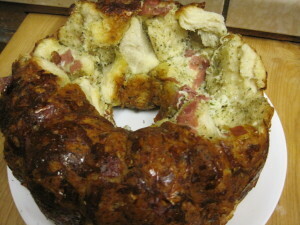 The recipe was for pepperoni and cheese pizza pull apart bread, and I was intrigued by the idea. When I got home, I tried to find the exact recipe that she had used, but couldn’t remember which site had been linked to her page. 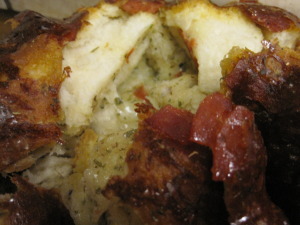 I found a recipe at StockPilingMoms.com. I read it and realized that I already had everything in the house that I needed to prepare the recipe for dinner. 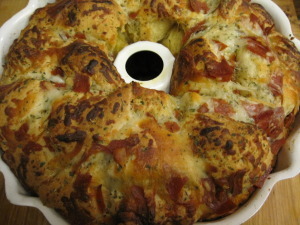 I decided that pull apart pizza bread sounded like a fun and family friendly dinner for a Friday night . My oldest son and I worked together to get it into the oven. After we chopped the pepperoni, mixed herbs and spices into olive oil and shredded cheese, we cut up the biscuits and mixed everything together. We put it all into a well oiled bundt pan and placed it into the oven to bake. The recipe took longer to bake than indicated in the recipe on Stockpiling Mom’s, but since our only side dish was a green salad and some homemade pizza sauce, the extra 10 minutes didn’t really matter. 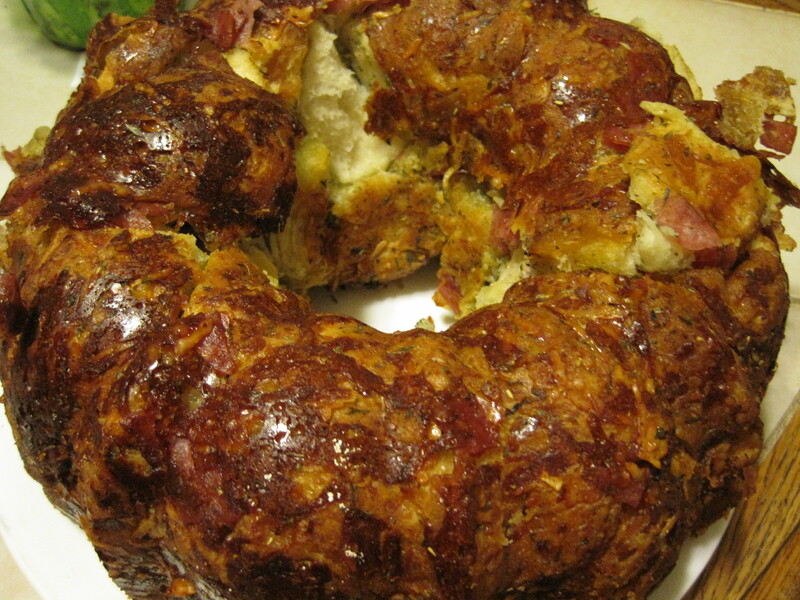 When the bread was ready, there was a great deal of grease in and around the bread in the pan. I wanted to invert it onto a plate, but I didn’t want to be burned by hot grease. The grease from the oil, cheese, and pepperoni also boiled over in my oven during the baking process, so I strongly recommend that you put another pan or foil under your bundt pan so you won’t have to clean your oven after dinner. I allowed it to sit for about 5 minutes until the grease was reabsorbed. Those 5, very long, minutes were pure torture because the pull apart looked and smelled delicious. When the grease was largely reabsorbed, I attempted to invert the pan onto a plate, but the bread was stuck. I tried to release it by running a knife around the edges. The bread was still stuck, and the pan was still extremely hot. I inverted it over a plate again. It was still stuck. In frustration, I began to bang the plate and pan up and down on the counter, trying to bounce the bread free of the pan without burning myself while my son laughed hysterically. Finally, it released and settled onto the plate. Unfortunately, a full third of the bread was still stuck in the pan. Carefully, I pulled the remaining pieces of the bread from the pan and attempted to reassemble the bread prior to serving. It was still very hot. It kept steaming up my lens while I tried to take photos. I did my best to reassemble the bread on the serving plate and delivered it to the table with an apology about its appearance. My family was gracious and accepted their disfigured dinner and devoured it completely. The taste of the dish was a complete success, but the presentation needed some work. 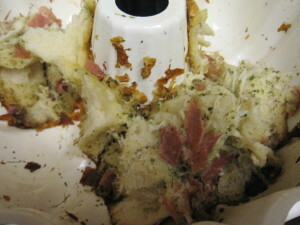 I wondered if sticking to the pan was the result of something I had done wrong while preparing the pizza bread. I tried again, but this time, I used salami instead of pepperoni, and I sprayed the pan with a non-stick cooking spray instead of rubbing it with oil. 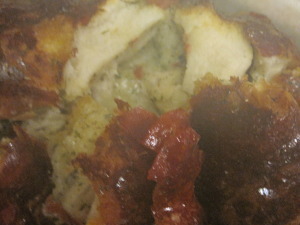 Once again, it took 40 minutes instead of 30, and it boiled over in my oven again. I forgot to put foil under the pan which meant that I had to clean the bottom of the oven again. Do you want to guess what else happened again? It’s OK. I’ll tell you. It stuck. This time it came out of the pan a little bit better, but I still had to pull the stuck pieces out of the bottom of the pan. I also had to clean up the spilled grease from the kitchen. I didn’t wait for it to be reabsorbed before plating this time. Then, I had to reassemble it on the serving plate. It looked better this time, and it tasted just as delicious with the salami instead of pepperoni. As I ate, dipping pieces of pizza bread into my home made pizza sauce, I considered my failure. I realized that it might not really be a failure when I remembered that I had never seen a picture of the pizza bread inverted onto a plate. Every blog that posted the recipe showed it from the top after it baked. 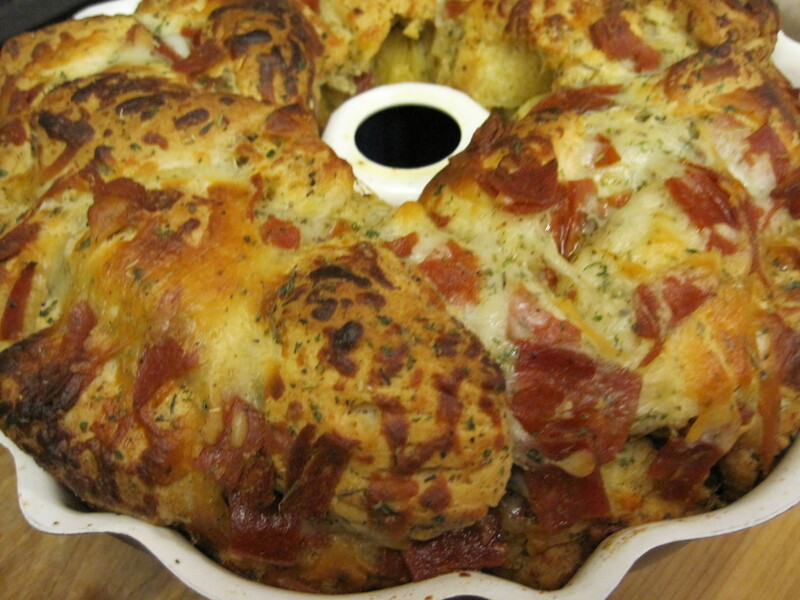 Of course, it makes a prettier picture from the top, but it made me wonder if anyone has managed to remove the pizza pull apart from the bundt pan and place it onto a plate without the entire thing falling apart. I began my search. Finally, I found a version of the recipe at InTheKitchenwithKP.com. 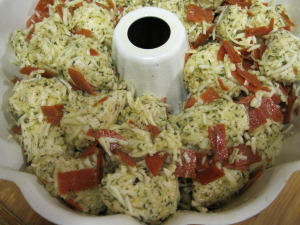 I noticed that, on her site, she also had a picture of the bread inverted onto a plate outside of the baking pan. Do you know what that means? It means that I have to keep making this until I figure out what I’m doing wrong. 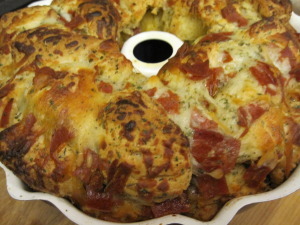 Of course, I may make a few more changes to the next batch and offer up a different type of pizza pull apart bread. If it taste’s good, I’ll post the recipe. I’m thinking that maybe it will come out of a smooth sided tube pan, like the one used for an Angel Food cake, easier than it does from the bundt pan. 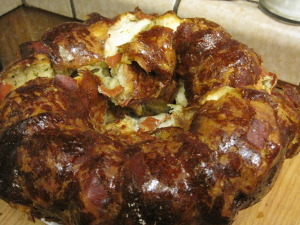 Ultimately, if I can’t make it work in a tube pan, I may just bake it in a 9X13 or a cast iron skillet like SeriousEats.com used. I could also pile it into a bread pan or two. However I bake it, this recipe is a keeper and will find itself on my rotating menu plan. I strongly encourage you to visit one of the pages I have linked above and try it for yourself. You’ll be glad you did. If you try the pull apart pizza bread, please comment and share your results. I’m particularly interested in knowing how people successfully get it out of the pan in one piece.